Burlap + lace may initially seem like an unlikely combination, but paired with other classic decoration details in this romantic Lullaby and Goodnight boy baby shower by Brittany of GreyGrey Designs, they were a match made in heaven. Designed around a neutral color palette and with celestial details of a moon, sun and stars — mixed with musical accents and embellishments — this unique lullaby and goodnight shower was the perfect setting to help a wonderful mom-to-be prepare to welcome her precious baby boy. 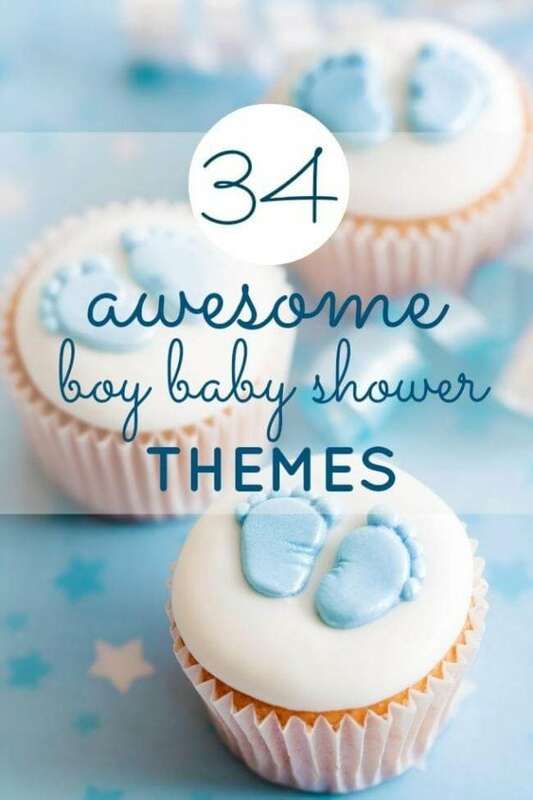 Don’t miss out on these Sweet Boy Baby Shower Ideas. Checkc out these 21 Free Boy Baby Shower Printables you will love. Gretchen, of Three Little Monkeys Studio, contributed her talents with a classically beautiful invitation and printable party décor. The addition of sweet and savory eats at the quaint 19th Century venue, paired with the soft colors and beautiful textures, created a swoon worthy celebration for honoree and guests alike. Designed around a backdrop of layered lace and burlap, the dessert table styled on an heirloom buffet piece was a striking combination of masculine meets feminine. Beautiful handmade ribbon garland and a custom lace trimmed paper bunting added such lovely details, and contrasted nicely with the rustic buffet and metallic shimmer on the repurposed hat box cake stand. In lieu of a baby shower cake, palate pleasing desserts included sparkly star and moon topped cupcakes in custom wrappers and fresh fruit for dipping in the chocolate fountain. Delicate paper lanterns added to the tables charm. The gorgeous cupcakes from Simply Done Catering and Cupcakes are an absolute work of art. The stunning cupcake tier is filled with music notes. Moons and stars created out of glittery paper top the cupcakes. Brittany used the space well by adding tiers and layers with her serving pieces. A menu was hand printed on a framed chalkboard for guests to refer to. This is a great alternative to individual food labels. Savory finger foods were elegantly served in another area of the venue using a mix of pretty cake stands and platters. A nice gift opening area was created with paper lanterns and a lovely lace and burlap wreath (made by Sweet Georgia Sweet), which was added to the wrought iron railing. Each lace or burlap covered table had an eclectic mix. There were picture frames containing snapshots of the mom and dad-to-be and beautiful hydrangea centerpieces; the DIY vases were created from clearance Christmas tin finds. Brittany did an unbelievable job transforming them into unique vessels using scrapbook paper and a variety of embellishments. Spray painted alphabet blocks added a fun baby inspired touch. These DIY projects are a cost-effective way to add personal touches. What a beautifully executed event by Brittany! You may remember this Boy Meets World baby shower or Bun in the Oven baby shower, also by Brittany.